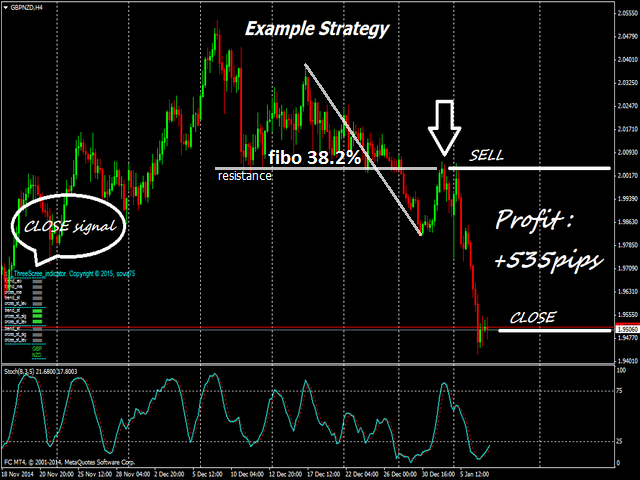 The indicator is intended for manual multi-currency trading based on the Triple Screen Strategy. 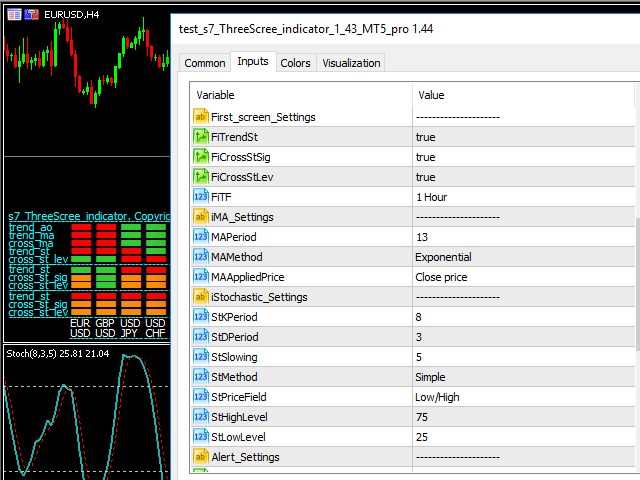 The full version can be downloaded at the link MultiSymbol Triple Screen Trading System MT5. The indicator uses the modified Triple Screen Strategy for determining trend direction in the third window via Awesome Oscillator, Moving Average or Stochastic Oscillator at the trader's discretion. 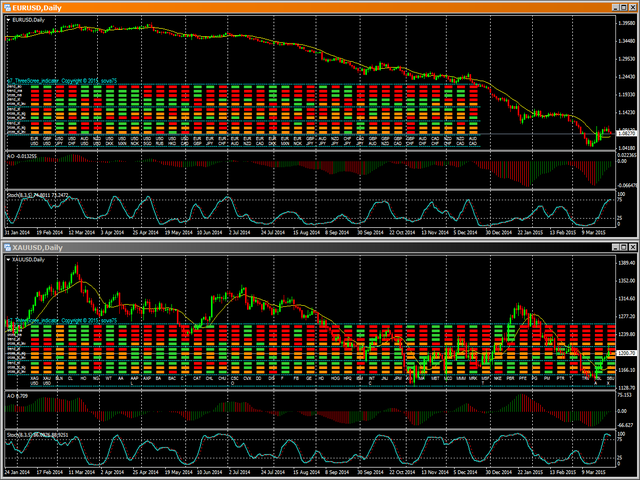 The oversold/overbought level is determined in the second window via Stochastic indicator. 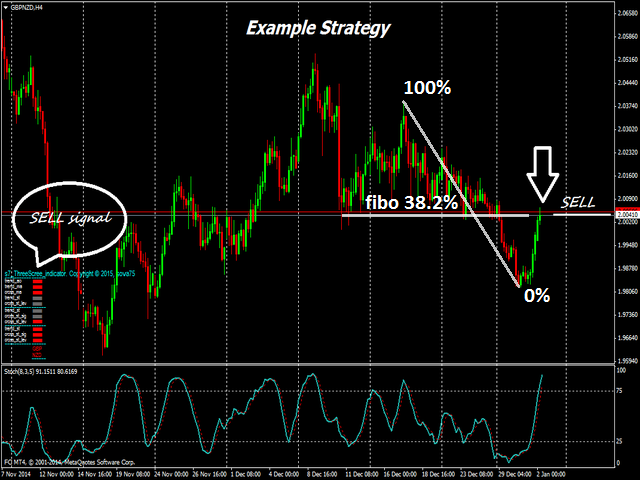 We also use Stochastic indicator in the first window, but this time we are determining the best market entry point. As a result, we obviate the necessity to move pending orders according to the market (what the classical system requires) and can enter the market at once. 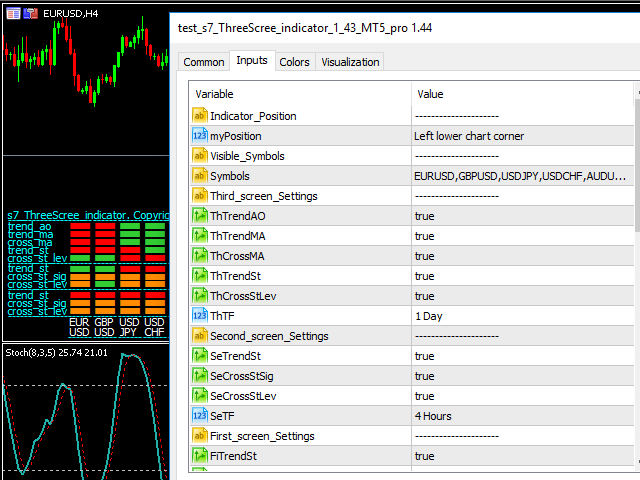 The indicator will be useful for those who prefer multi-currency trading. If you use the Triple Screen Strategy, you have to analyze three time periods for each instrument. You need a lot of time to work with a large number of symbols. We created this indicator to facilitate this work. It independently analyzes all chosen instruments by three time periods. When it finds the required combination of parameters' values, it notifies a trader about a possibility to perform a trade. 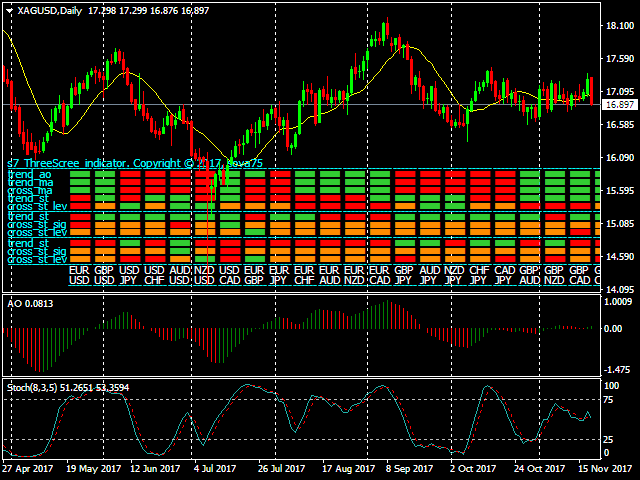 The trader only needs to specify parameters which will be used by the indicator to check the possibility to perform the trade with given instruments. 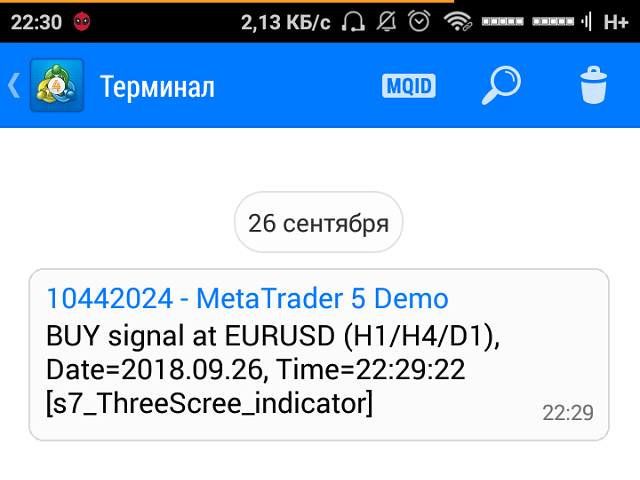 The indicator informs the trader about the possibility to perform the trade by means of a message popping up on the screen, sending message to an e-mail or a mobile terminal, or just by a sound notification. The indicator works with current prices (uses the zero bar). 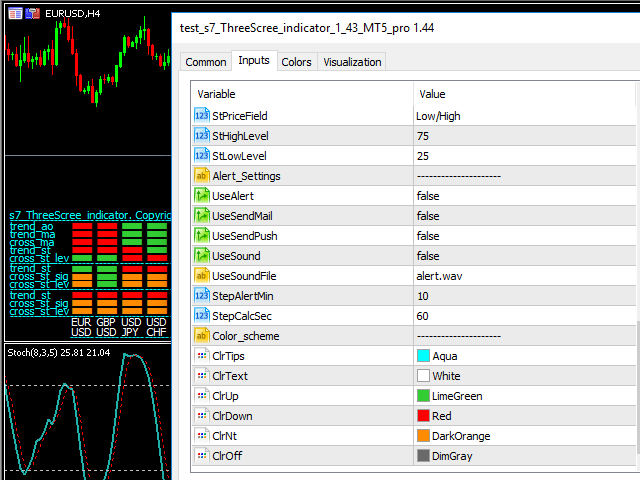 To reduce the CPU load, it is possible to customize the period for redrawing the indicator values. gray - parameter is disabled. 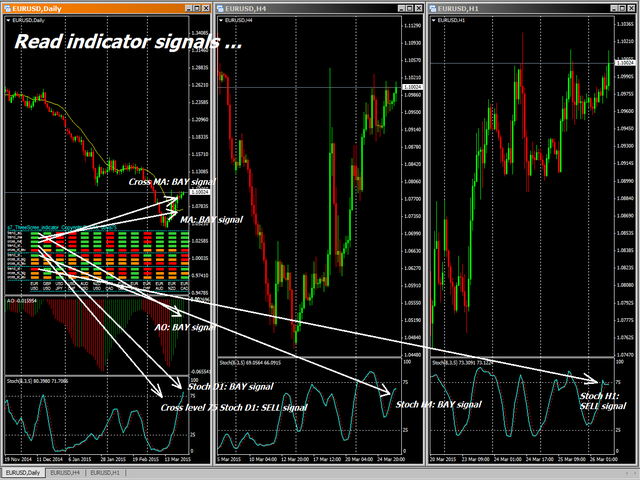 Screenshots below indicate an example of trading using this indicator. The indicator was developed for the contest of traders using manual trading based on the Triple Screen Strategy.